For Dipti and Sachin, their first pregnancy was magic. They knew exactly how many weeks and days she was at all times, they talked about every little thing related to it (flutters, kicks, growth), they took monthly pictures, and Dipti was all about dressing the bump in cute ways. This time, it’s a little different. This time, there’s a little something extra to this pregnancy which makes it a completely different experience: a toddler. The first pregnancy Dipti definitely had “the glow.” She would admire her radiant skin, her thick flowy hair, and take in all the compliments and well wishes of being pregnant. This time, Dipti finds that the pregnancy glow is masked under the dark bags under her eyes, the last of her hair that Diav hasn’t pulled out while he’s “massaging” her, and her envy of first time pregnant moms. With a toddler in the picture, the “glow” not only needs a lot of cosmetic enhancement but also gets quickly replaced by sheer exhaustion. We can all still remember her pregnancy diaries with baby #1. She noted everything – how much D was growing, his kicking, his turning, what part of his body was sticking out when, everything! She was also super into dressing the bump in cute ways and constantly looked up baby bump fashion… Oh the days! The growing baby bump is exponentially faster this time around – she looks the same at 4 months as she did at about 8 months, and it’s throwing Diav off completely. He’d rather use the bump as a “slide” for his cars and trucks rather than talk to baby and feel him kick. He also likes to try to press it back “in” which is not the greatest feeling for Dipti. The growing bump isn’t as fun to dress either as having a toddler requires plenty of wardrobe changes when things are thrown at you or spilled on you, or puked up on you. It also has changed to comfort over fashion as those days of heels and jeans are replaced by sneakers and leggings to run after the flight risk that is our toddler. 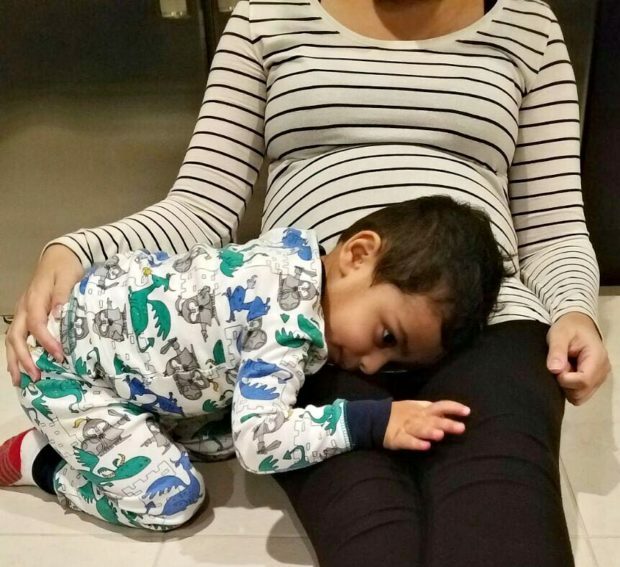 Dipti only really felt super tired during first trimester and the last month of her first pregnancy. And when she did she would put her feet up on the couch, wrap her heating pad around her back, and relax. This time the fatigue is constant and recovery is non-existent. This pregnancy Dipti has moments where she literally thinks her legs are going to give out beneath her! So what does she do? Nothing. She keeps trecking after her toddler who, somehow, has a sense of her being tired and insists on playing “catch me” or throwing every toy at her face until she responds. On one of those very rare occasions where he wants to be sweet, he’ll say “momma lay down, Diav massage momma hair” and proceeds to pull one strand out at a time. Depends on who you’re talking about. These days Dipti and Diav have been having their fair share of insanity. With Diav entering his terrible 2’s and Dipti entering second trimester, emotions have been running high in the household. When Sach walks through the door in the evening, he doesn’t know whose complaints to address first – Diav is trying to tell him that he doesn’t like the last 3 bites of his dinner, and Dipti is trying to tell him that Diav is driving her bananas and that every inch of her body hurts. At least with the first pregnancy Sach had one toddler to take care of, now he just has a lot more “late meetings” at work than he ever did! First time around hubby gave Dipti all the attention in the world – he would text her asking how she was all throughout the day, ask for pictures of the bump, make her special meals when she had cravings, massage her feet and back, and be super available in case she wasn’t feeling well one day. Having a toddler in the picture basically means hubby’s attention for preggo versus toddler is split around 13% – 87%. He tries to be there for her as much as he can but of course Diav is at the door waiting for him when he comes home and demands all of this time until he goes to sleep, which leaves Dipti about an hour to vent about how tired she is, and to complain to hubby that he doesn’t text her enough throughout the day. Luckily they get those few minutes at the end of the day when Dipti is in excruciating pain where Sach will massage her back for 4 minutes before they both pass out. Fatigue has been the hardest part of it all! We’ve learned a few tricks from Momma Vaid (who has been an angel and watched Diav for days at a time to give Dipti a break). She suggested that when Dipti needs a break, she puts Diav in his highchair with some kitchen utensils and let him “make dinner” for baby or “clean baby’s dishes” and so far it’s worked! He loves to pretend like he’s doing stuff in the kitchen so it’s the perfect solution to let Dipti relax for a half hour at a time. He also is getting used to playing in his playroom by himself which he never liked to do so that is a huge relief! Hubby has been doing everything in his power to be there for both of them, but Dipti has learned to live with the fact that Diav has more needs than her (ugh!) and that he’s more fun than her! Sach loves to spend time with Diav in the evenings because he’s fed and happy and super excited to see daddy, so the two of them spend that time together (also gives Dipti a mini break). 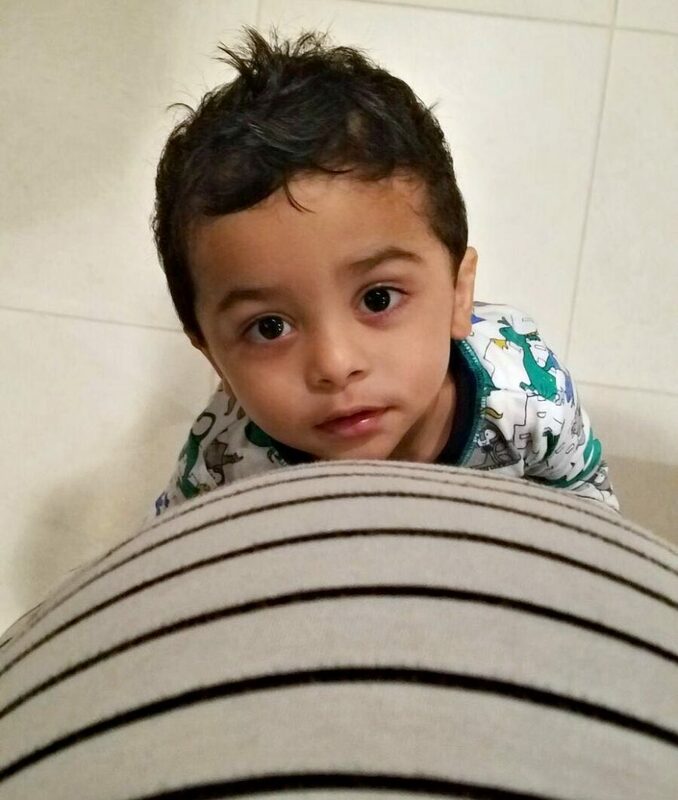 Dipti gets the few moments of attention from him throughout the day and it’s plenty to know that he’s as excited (and terrified) about #2! Any tips and tricks that you guys have learned along the way to get through pregnancy number 2 with a toddler?